The Alkaline Diet is pretty simple to follow: eat and do things that are highly alkaline. That’s it! So as long as you remember what is acidic and what is alkaline, you’re good to go. Whether is raw or cooked, the most important thing is that you stay highly alkaline, say 80% alkaline and 20% or less acidic. But there are some important things to keep in mind too that most diet either frown upon or don’t take into account that are critical to the Alkaline Diet. There are four elements that one must follow in the Alkaline Diet: Healthy Oils, Chlorophyll, Salt, and Water. I’ll discuss each element below. These is always a point of disagreement in a lot of diets and lifestyles. Most people think of oils as the oil they use to fry french fries at McDonalds or any fast food place. But our bodies, and specially our brains need oils… Healthy Oils! We find this is an area where most people are not educated in, and we get a lot of questions about it. We need omegas (3, 6, and 9) to function well and regenerate brain cells. Because of combining the vegan diet and the Alkaline diet, we only take vegan oils that offer a good healthy amount of omegas. Most people think vegan oils with omegas don’t exist, they believe they have to get them from fish. You can if that’s what you want. For spiritual reasons, I don’t consumer animals. So I choose vegan oils such as Hemp Seed Oil (2 to 1 ratio), Flax Seed Oil (3 to 1 ratio), and Chia Seed Oil. Omega 5 oils are Avocado, Coconut (which helps to absorb omega 3 oils), and Pomegranate Seed Oil. Most people and people eating the SAD don’t get enough servings of healthy greens (Chlorophyll). These include plant foods (Kale, Lettuce, Chard, etc), vegetables juices, and green powders (Alkavision or Dr. Brocs). Even vegans may not be getting enough alkaline vegetables or green juices. Another topic that is very tabu in the health community is Salt. Most people think we Alkalarians mean the disgusting Morton salt most people have in their kitchens or some may imagine we refer to the “healthier” version: sea salt. Just two days ago someone told me that they don’t eat salt because it shrinks their organs! Again, if a person is eating the SAD, they eat a lot of sodium from processed foods and drink non-hydrating liquids, well yes, salt will not be healthy for them. For those of us in the Alkaline diet, salt is critical. The best salts are Real Salt from Utah and Red Alaea Salt (Hawaiian Salt). These Hawaiian salts can be found in different types. Another type of salts that are crucial in the getting healthy are Magnesium and potassium salts which are key minerals for the body and the nervous system. I’m not talking about drinking 8 cups a day, I’m referring to the quality of the water and the pH of the water. 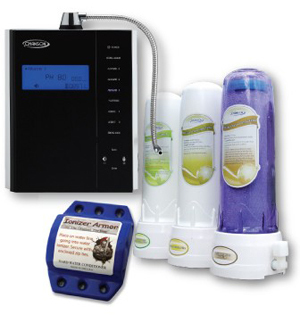 Pure alkaline IONIZED water with a high pH such as 9.5 and an ORP of 150mV. That’s the kind of water! Your body will thank you for it. In fact, if you are planning in making one change today, this is the most critical in my view. Start by getting an ionizer and if you can afford it, a nano filter too. If you are not able to afford purchasing these two, you can buy bottled water with high pH like Essentia water. Don’t trust what it says in the bottles of the water you buy, do your research. Right now, Essentia is the only brand left in the market that you can trust. Eat more healthy oils: Hemp, Flax seed, and Coconut oil. Even one change you make today will start improving your health! I’ve been posting pictures of my steamed alkaline food on instagram and many have asked for recipes. I started steaming alkaline vegetables a few months ago because towards the end of last year I had been eating a lot of acidic foods and even though they were raw, it was acidic. The idea with eating steamed food was to reset my taste buds and help my body become more alkaline again. Denis and I just a conversation about how when we discovered the Alkaline principle that we stayed pretty alkaline until we went to our first raw food festivals in Sedona in 2008 ans we were told cashews, chocolate, mushrooms, and agave were good for you. We knew better but didn’t listen. The recipe for steaming alkaline food is simple. I take my list of alkaline food and throw any combination of these in the steamer. I don’t steam avocados or seeds or fruits. Everything else I steam and then add oils when the food is done ans on my plate. I use all my ingredients fresh from Josh’s Organic Garden, so I only have to steam them for less than 10 minutes. I don’t buy anything frozen because it’s not considered raw. My steamer has a timer, so I add all veggies but the greens and spices and oil and set the timer for 10 to 12 minutes. When there is about 2 minutes left, I add the greens and cover until the steamer rings and shuts off. I add hemp oil to all my meals that are cooked so I can get all the benefits from the hemp oil and not complain about the taste. A major reason I steam some food is to reset my taste bud and to learn to eat oils I did not like when I was only eating raw. Serve warm with seasonings.This is enough food for me for dinner or sometimes I have leftovers for the next day. Do not microwave or warm up again! Anything good left in the food will be dead if you microwave it. You can change the ingredients with any of the vegetables on the Alkaline list and add other seasoning or spices or even hot peppers and the seasons change and other veggies become available. Below is a picture of garbanzo sprouts, broccoli, and peas as as different mix. I have talked about alkaline foods but many of you have asked what are acidic foods that can be eliminated from your diet for anyone, not just those with disease or transitioning to the alkaline lifestyle. In the Alkaline lifestyle, foods that are not alkaline are considered acidic and are below 7 in the pH scale. These are the foods that cause disease and allergic reactions to the body yielding an unhealthy environment for disease to grow and bacteria to thrive. These foods have been linked to cancer and heart disease. Anyone who wants to improve their general health can start avoiding these gradually and adding more alkaline foods to their diet to see results. From loosing weight to improving heart disease, these changes to your lifestyle will make a difference. Many doctors are starting to recommend a vegan lifestyle for heart disease patients. But it’s important to understand that a vegan diet can also be acidic or unhealthy. I was a raw vegan junk food eater and a vegan junk food years ago too. Before the decision to be a vegan became an energy/spiritual path reason, I would not mind eating french fries at a fast food joint, or eating a mushroom burger with fake cheese and drinking a sake bottle. I could still be a vegan, but the choices I was making were not healthy and highly acidic. The same can be said about eating a raw vegan diet. There are those that eat 30 bananas a day believing that’s healthy because it’s fruit that fell from a tree. The truth is that tropical fruit is acidic and creates a terrible environment for the body. You might as well eat a steak! Making healthy choices can be difficult but making small steps can be beneficial to your health. One of the most frequently asked questions I get about eating raw vegan is what kitchen tools or appliances are needed. The reality is that you don’t need much, and it’s possible that you already have some of these things. But if you want to invest money in your new lifestyle, it’s important to understand why you will use them and how to use them. Don’t let this stop you from starting your transition to a vegan or raw lifestyle though. I’ve put together a list of the things I own and how I use and I will tell you on a scale of 1 to 5 how essential they are, 5 being EXTREMELY Essential. Water is super important! In fact, if you aren’t ready to be 100% vegan, invest in a nano filter water system and a water ionizer right away. Denis and I got our ionizer in 2004 and were lucky that prices were lower back then, though at the time, I was right out of college and still a bit broke 🙁 So it was a lot of money to me. We finally got a nano filter last summer and haven’t looked back since then. I get the best water I can afford whether I’m vegan or not. (Yes I’m strictly vegan, just saying you don’t need to be to have good water). So in the scale, I’d say this is a 10. Yes, super extra extremely important to your health! I would recommend to brake your piggy bank and get a nano filter asap. This get a number 5 on the scale. Super important even if you are not vegan or raw! I’ve had a Food Processor since I was 12 years old! I don’t know how people cook or prepare food without one! I use it at least once a day. For real! Like this is my most valuable possession if someone breaks in. Ok, the ionizer is my most valuable possession but we won’t tell my 10 cup Food Processor. I use to make pates, to cut veggies, to make puddings, to make sauces and salad dressings, and who know what else! I just love it and can’t live without it. I have had my Vitamix since 2004 before I became vegetarian even. So I don’t know what life is without one. This is a number 5 on the scale and a great investment to your health. I do have to confess though that the first few months I had a Vitamix, I used it to blend cocktails for after work, made great Pina Coladas and Strawberry Daiquiris in it. But later, I was glad I had it and was able to use it during my transition to vegan and raw. I love Vitamix and 100% of my friends have it. I only know one person at work with a different kind of high speed blender and most people I talk to say they prefer Vitamix. Very important and if you don’t have good sharpened knives, then get some. Ceramic are great but if you are on a budget, you can also get MAC Knives at an affordable price. I don’t have a whole set. In fact, I only own three knives and that’s enough for me. Unless you are planning to juice every day, I say this is number 3 in the scale. (OK, I bunch of my friends just went, WHAT?). I don’t like juicing, it’s a lot of work for me, and I don’t have to juice because I have Josh’s Organic Garden three mile bike ride from my home. So that’s why to me it’s not so important. I also calculated what I pay for juices at Josh’s compared to if I was juicing, which I did try for a whole month, and it came out more economical for me to buy my juices each night. But if you want to have a juice and have the $200+ hanging around in your pocket, then yes, get one. The trick about juicers is to get one that doesn’t heat up the vegetables. I recommend single gear juicer which masticates or chews your vegetables. I only use mine to make my Raw Vegan Kimchi or to make fruit sauces. I use to make veggie noodles and it doesn’t cost much. It’s fun to have but not a must. So it gets a 2 on the scale. I don’t use mine much, I did at the beginning when transitioning to 100% raw. I use for parties when I make Indian Raw Food or my some of my party recipes. I do wish I had bought one with a timer. So that’s what I recommend you do if you want to get one. In the scale, I give the dehydrator a 1. OK, this was a purchase made by Denis. How many times have we used it, five times since we bought it with a 20% discount. So I’m thankful I didn’t spend much money on it. It’s fun to have if you like to make ice cream and you are an ice cream lover. I’m not. Denis is, but he doesn’t make much food. So to me this get a -2 on the scale… unless you are an ice cream lover, then it gets a 0. So to summarize, nano water filter and water ionizer are the most important, the Vitamix next, then the Food Processor. All others come later. Which one would you buy first and why? I love soups! I think I have mentioned that many posts ago and if you noticed, a lot of my recipes are for soups. Denis and I recently took a trip to Colombia in South America and had a blast. But after 14 days of plain salads, I was ready for some “fancy” raw food. However, we got home and drove to the Green Wave Cafe right after the airport! Yes, we wanted some raw food! The next day though we had no food in our refrigerator but fortunately it was Sunday and time for shopping at Josh’s Organic Garden. He had everything I wanted and more! The spinach, for some wild reason, looked amazing to me. I’m not a big fan of spinach but once in awhile I go crazy for it. And when I saw last Sunday at Josh’s, I wanted Cream of Spinach. So I googled it and then modified the recipe for my raw lifestyle and here is how I created my own Raw Vegan Cream of Spinach Soup. Add everything in the vitamix and blend until smooth. If too much water or not enough spinach, add more spinach or cashews. I also like to add a celery stalk and some Italian seasoning even though the common cream of spinach soup doesn’t call for either. Let it blend until it has the consistency that you like, if you want more creamy add more seeds or cashews. I let it blend until is a little warm or sometimes I add warm water so that it’s a little warm. Serve with some raw crackers or raw bread and sprinkle some black pepper. It’s delicious and nutritious!